Both concrete and steel were becoming more available for bridge construction in the late nineteenth century. This inspired designs for systems of steel reinforcing to produce longer concrete spans. Austrian engineer Josef Melan introduced a system in 1892 that used arch steel beams set in concrete. Melan arch bridges could be constructed quickly and were stronger than many other designs, leading to their widespread use. Frederick von Emperger, described as a "go-getter in engineering," came to the United States in 1893 to promote Melan's system. The following year, he oversaw the construction of the country's first Melan arch bridge near Rock Rapids, Iowa. 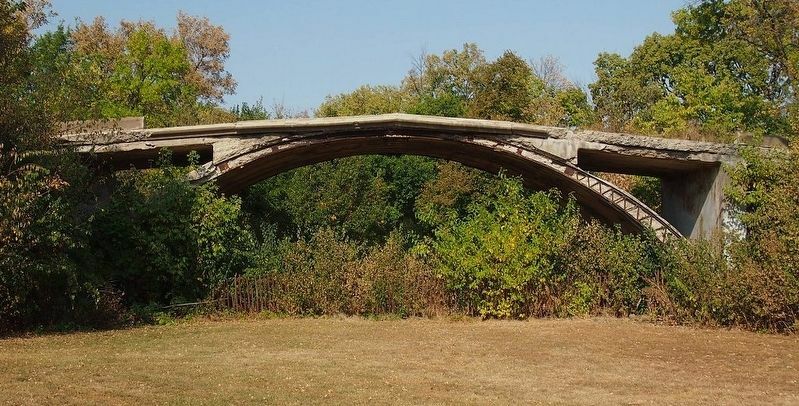 Within ten years, there were almost 300 Melan arch bridges in the United States, and by 1924, bridges using rigid reinforcement numbered over 5,000. Due to its ease of construction and aesthetic appeal, the Melan arch remained a popular bridge design in this country until the 1930s. 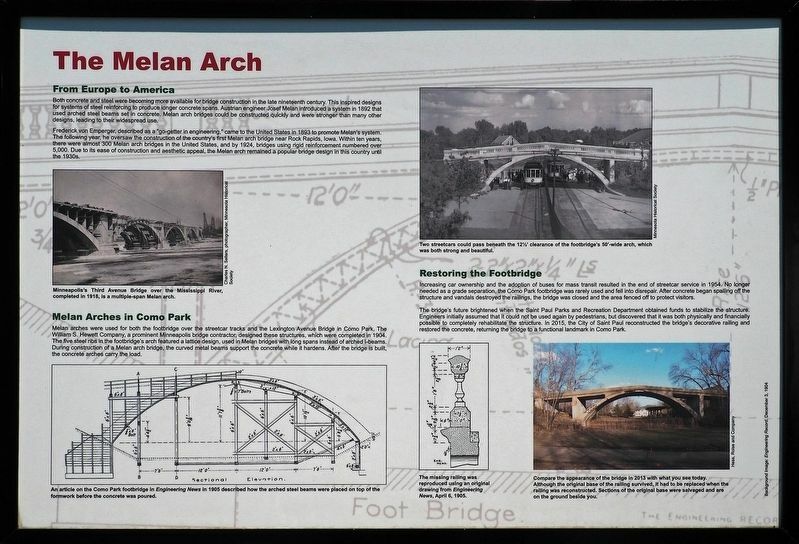 Melan arches were used for both the footbridge over the streetcar tracks and the Lexington Avenue Bridge in Como Park. The William S. Hewett Company, a prominent Minneapolis bridge contractor, designed these structures, which were completed in 1904. The five steel ribs in the footbridge's arch featured a lattice design, used in Melan bridges with long spans instead of arched I-beams. During construction of a Melan arch bridge, the curved metal beams support the concrete while it hardens. After the bridge is built, the concrete arches carry the load. Increasing car ownership and the adoption of buses for mass transit resulted in the end of streetcar service in 1954. No longer needed as a grade separation, the Como Park footbridge was rarely used and fell into disrepair. After concrete began spalling off the structure and vandals destroyed the railings, the bridge was closed and the area fenced off to protect visitors. 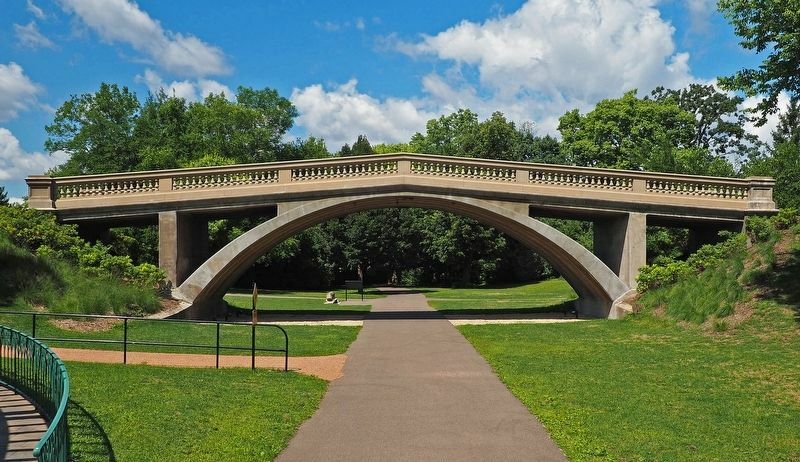 The bridge's future brightened when the Saint Paul Parks and Recreation Department obtained funds to stabilize the structure. Engineers initially assumed that it could not be used again by pedestrians, but discovered that it was both physically and financially possible to completely rehabilitate the structure. 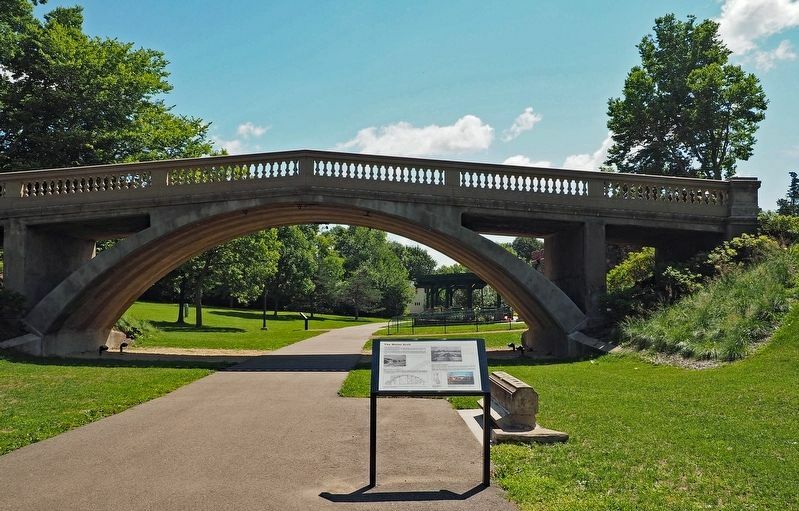 In 2015, the City of Saint Paul reconstructed the bridge's decorative railing and restored the concrete, returning the bridge to a functional landmark in Como Park. over the Mississippi River, completed in 1918, is a multiple-span Melan arch. Caption: An article on the Como Park footbridge in Engineering News in 1905 described how the arched steel beams were placed on top of the formwork before the concrete was poured. Caption: Two streetcars could pass beneath the 12½' clearance of the footbridge's 50'-wide arch, which was both strong and beautiful. Caption: The missing railing was reproduced using an original drawing from Engineering News, April 6, 1905. Caption: Compare the appearance of the bridge in 2013 with what you see today. Although the original base of the railing survived, it had to be replaced when the railing was reconstructed. Sections of the original base were salvaged and are on the ground beside you. Location. 44° 58.708′ N, 93° 8.781′ W. Marker is in Saint Paul, Minnesota, in Ramsey County. Marker can be reached from the intersection of Lexington Parkway and Horton Avenue. Touch for map. The marker is west of the footbridge near the Historic Streetcar Station in Como Park. Marker is at or near this postal address: 1224 Lexington Parkway N, Saint Paul MN 55103, United States of America. Touch for directions. distance of this marker); The Picturesque Landscape (within shouting distance of this marker); The Hamline Plaza (approx. 1.2 miles away); Al Avila (approx. 1½ miles away); Terry Reynolds (approx. 1½ miles away); Kenneth Wayne Stauffer (approx. 1½ miles away); Tom Greenwade (approx. 1½ miles away). Touch for a list and map of all markers in Saint Paul. More. Search the internet for The Melan Arch. Credits. This page was last revised on March 11, 2019. This page originally submitted on March 7, 2019, by McGhiever of St Paul, Minnesota. This page has been viewed 45 times since then. Photos: 1, 2, 3, 4. submitted on March 7, 2019, by McGhiever of St Paul, Minnesota. • Bill Pfingsten was the editor who published this page.